Our plans to rent a storage locker have changed. 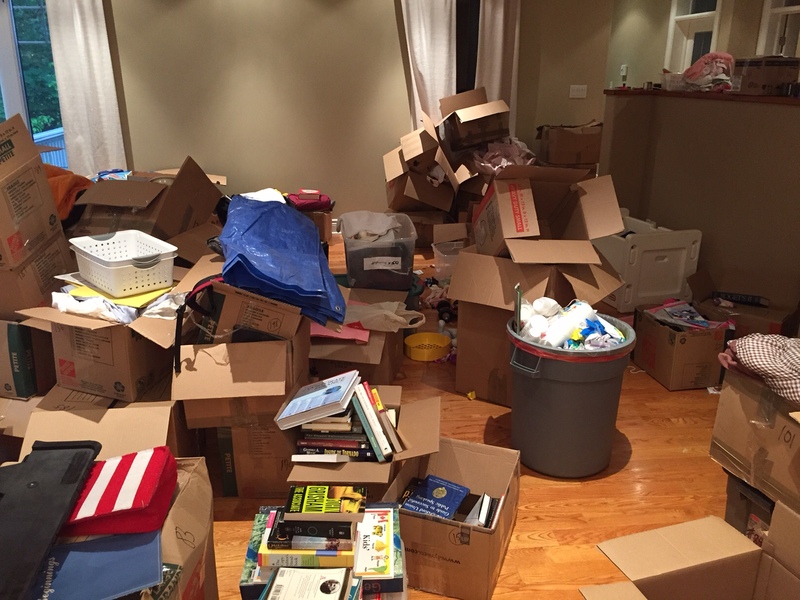 And, my sister-in-law’s plea to give her no more than 6 or 7 boxes kickstarted our day – now, more than ever we were on a mission to downsize. We accomplished this today, through laundry, and sorting through boxes in our living/dining room. We are slowly closing up the rooms in our house. At this point, we are all sleeping in the master bedroom, in three different beds. All of our clothing resides in the same closet. And, upstairs, two of our three bathrooms are kept clean, never used, and are locked. A couple of weeks ago, I took most of my children’s clothing to the thrift store. No one seems to have noticed or care, except me. There is far less laundry. I am paring down our clothing to match a packing list that I created for onboard clothing. My packing list is still in development. But, essentially, each child has been reduced to 2 pairs of pants, 6 t-shirts, and 4 pairs of shorts, and some other clothing. When I fold laundry, I use a clear garbage bag ready to put extraneous bedding, clothing, and towels. I sound so organized that I almost fool myself. So, allow me to show you our living room. 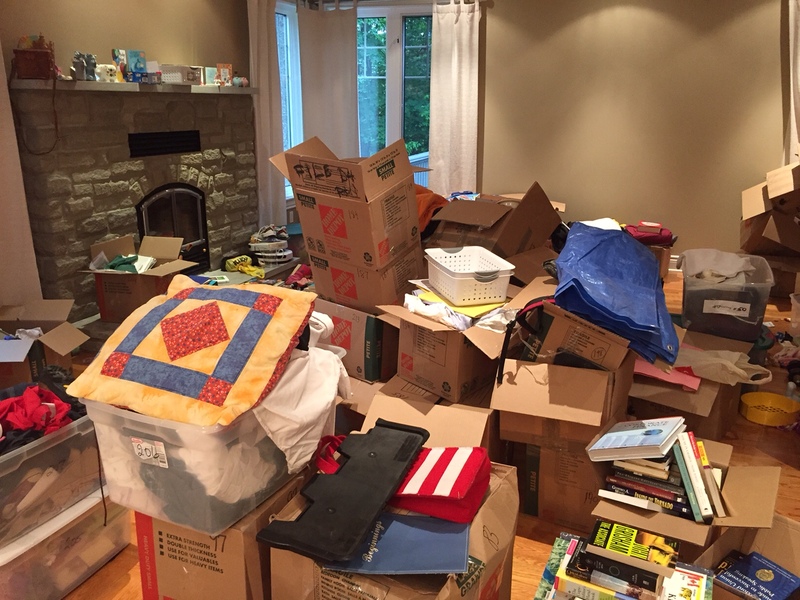 Our living room at noon today: empty boxes, kitchen boxes, clothing boxes, and more boxes. 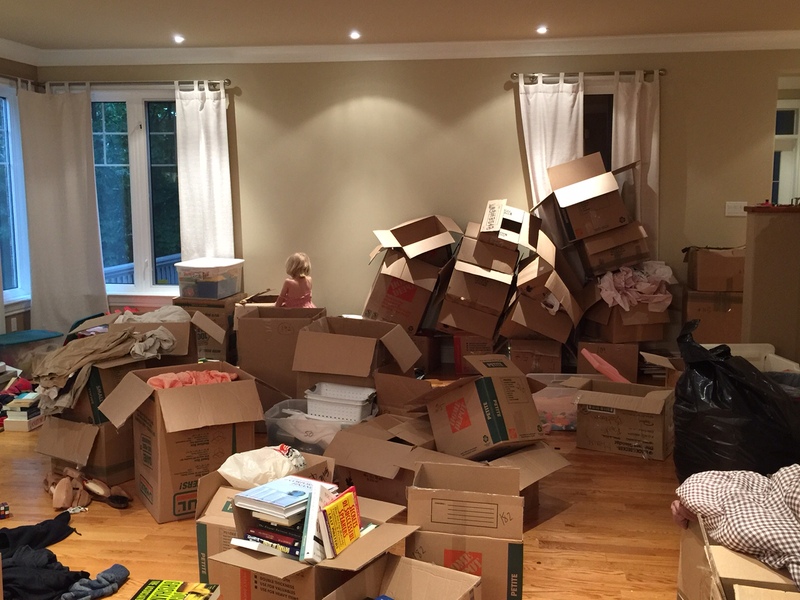 We thought we were going to move last year, which is why we have all of our belongings in boxes. This is stuff we own that has been in our basement, virtually untouched, for almost a year. Later this evening: we bravely open boxes to reveal our stuff. All stuff to sort and downsize. Some of it, we will keep, but most of it we will send to the thrift store. We will keep the pillow case in the foreground, for example. The pillow case was made my Dorothy Burke, mom of YukonJen. I met YukonJen on the monkey bars in Whitehorse, YT when I was in Grade 2, and we have been friends ever since. The process of downsizing is entirely emotional and complex. At least for me. My husband seems to be a bit more matter-of-fact about the process. To me, it seems that every item in our house has a story. When my kids go back to school on Monday, and their teachers ask them what they did on the weekend, they might tell them that they watched television non-stop. But, my husband and I are working hard to create two categories of things – stuff to bring aboard and stuff to put in storage. By Monday, we should have made progress. Stay tuned for a picture of our empty living/dining room. Can I tell my parents now? 🙂 Spending Friday evening catching up with your blog. I am so HAPPY you decided to blog. AND I think you are a great writer. Wish we could Skpye sometime before you leave.